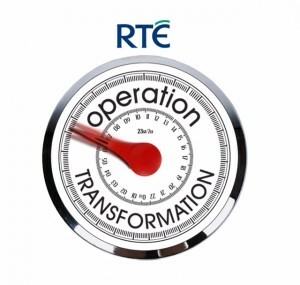 The famous Irish tv programme Operation Transformation is back with a new series to help people with their battle with diet, exercise and motivation. Do you feel your health is holding you back from the life you’d like? Do you wish 2014 could be the year you transform your diet and lifestyle for good? With Operation Transformation back with a bigger and better series you can now not only follow the leaders on RTE radio and on the web but you can also download the new exclusive app so you can follow the leaders on the go to help you with your life changing journey. Most of Ireland’s population will have vowed to diet in January and when we hear the word diet, many think of if as punishment and that you can only eat plain boring food. From watching the programme and trying their mouth watering recipes, you will never go hungry! Although the secret to a balanced diet is to have everything in moderation but if you stick to it and have a little will power you will get the results you want like Ronan Scully, a former Operation Transform leader who lost 3 stone and has now become a runner! TIP: Keep a food/fitness diary and track what you eat and what exercise you do. Looking back on it will prove to you what you can achieve and how far you have come. Although your diet is huge 70% of your goals, the other 30% is exercise. Exercising not only controls your weight, combats health conditions and diseases but also boosts your mood and energy. Physical activity stimulates various brain chemicals that leave you feeling happier, more relaxed and boots your confidence and self-esteem. With all these factors, why would you want to change yourself for the better? We all know it’s hard to find the will power to make big changes in our lives but that’s where Operation transformation comes in. With the programme lasting 7 weeks that’s gives you a great start to transform your lifestyle. TIP: exercising doesn’t have to be a chore, make it fun! Get a friend or relative on board to support you and take Zumba classes or join a local boot camp. 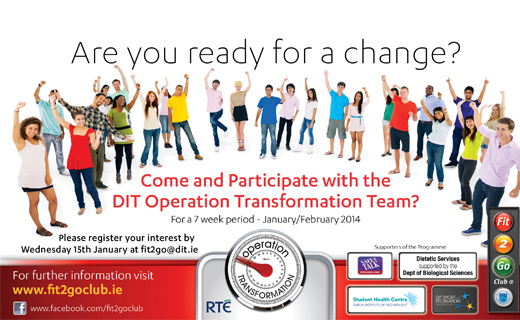 Register online with Operation Transformation to track the leaders and help followers with your tips and tricks on your progress! Good luck! Emma leads the Social Media team at Printerinkcartridges.ie in the good fight to increase the company's exposure on the web and of course make a few friends along the way. Often described as a 'social media whiz kid', Emma keeps busy by multi-tasking with blogging daily and organising prize draws for her readers. When not at work, Emma enjoys fashion, clubbing and training for deep space travel by sleeping.